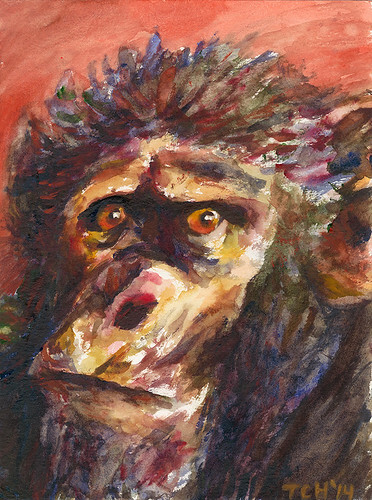 Cleve Hicks, who led our 2012-2103 survey to Bili, has submitted these two watercolor paintings he made of chimpanzees from Northern DR Congo to the Endangered: Art for Apes contest. Check their on-line gallery. 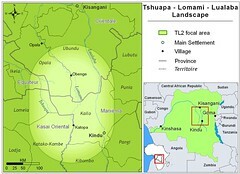 ‘I painted this watercolor of the chimpanzee orphan Kathé, who we rescued in the town of Likati, Northern DRC, in 2007. Kathé’s front teeth had been pried out with a hot knife, but this had done nothing to squash her endlessly playful, rambunctious character. 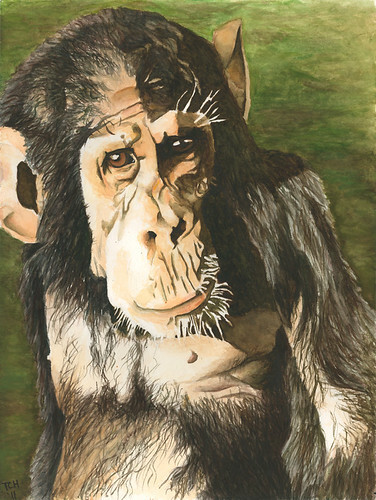 The painting was sold to a dear friend to raise money for the chimpanzee sanctuary in which Kathé finally found a home, the Lwiro Primate Rehabilitation Center. The Endangered: Art for Apes group works to raise awareness of wildlife conservation issues around the world through the visual arts, and all proceeds from the exhibition go towards the Center for Great Apes. These paintings are also on facebook and Cleve’s Bili report is available here. This entry was written by Terese Hart, posted on 2014-10-14 at 8:35 am, filed under Bili-Gangu. Bookmark the permalink. Follow any comments here with the RSS feed for this post. Post a comment or leave a trackback: Trackback URL.